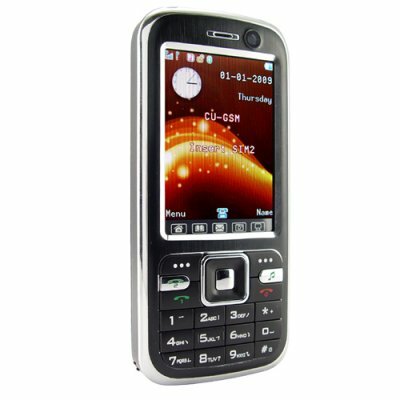 Successfully Added Quad Band Dual SIM Motion Cell Phone with Color Keypad to your Shopping Cart. Quad band dual SIM cell phone with color keypad. This touchscreen cell phone has two SIM card slots with dual standby and supports all of today's most popular media features along with multi -color lighting effects and motion shake for common media functions. The unlocked quad-band GSM mobile phone will keep you connected all around the world and with dual SIM slots (with dual standby) it allows you to have two active phone numbers within the same phone, this is a frequent travelers and businessman's ideal mobile phone! Of course any modern unlocked mobile phone needs to be easy to use and have plenty of PDA type productivity tools and media features, right? You better believe it! What you have here is everything you will ever need in a cell phone; modern phonebook + contact manager, easy to use keypad, TV and FM radio receivers, MP3/MP4 players, digital camera and video recorder, color LED illuminated keypad and casing, Ebook reader, Bluetooth, and many everyday use software tools. However, this mobilephone did not stop with just the simple media functions. What makes this phone particularly cool are its unique special features - motion control, torch light, UV light. With motion sensor settings, you give the phone a simple shake and slide between music , videos, pictures and more motion controlled functions. While the two lights provide plenty of opportunities to impress friends by lighting the way down a dark hallway or finding the hologram on currency. This mobile phone is in stock now and available for single sample or bulk orders. Order your stock now and don't forget to check our mobile phone accessories section to see our selection of Bluetooth speakers and earpieces. Quad Band GSM for use around the globe. Dual SIM cellphone (great for world travelers and playboys). Colorful LED effects for fun and common alerts. I see this cell phone come with a analog TV tuner, does it come with a digital TV tuner as well? No, the cell phone only comes with an analog TV tuner. You will be able to receive analog TV channels where ever you are, whether in Brazil or anywhere else in the world that broadcasts TV on an analog signal. Is this phone better than an iPhone? Without the high price or long-term contract, plus the features like FM radio and analog TV, many people feel our M2x series of phones (like this M21 model) are a great alternative and come at a much better price. bellissimo questo cellulare, ottimo prodotto !! !